Laser hair removal can permanently reduce unwanted body hair. Especially in Santa Barbara, where a swimsuit is common summer attire, people can feel self-conscious about unsightly body hair. Shaving, waxing, and depilatories do not provide lasting results, and the stubble or ingrown hairs that they leave behind can be more distracting than the hair itself. Laser hair removal can be used to treat hair on the face, neck, arms, underarms, back, chest, bikini area, and legs – anywhere that hair is a problem. Cynosure is a leader in laser technology for healthcare settings. Quality of the laser determines the results from laser hair removal. Cynosure is a company that has revolutionized laser technology, and is always in the process of striving to develop lasers that deliver the safest and most effective treatments available on the market. The Icon is a state-of-the-art laser that offers advanced cooling for increased patient comfort with two different laser handpieces sto allow customized treatments. The MaxR is the standard laser hair removal handpiece, and is effective in treating most hair and skin types. The MaxR has a larger tip to provide greater surface area coverage which means shorter treatment times. For finer or lighter hairs, the MaxY handpiece offers the best option for laser hair removal. Every provider has undergone extensive training to provide the safest and most effective treatment. Licensed providers Jessica Barker,PA , Heather Grieco,RN or Hayley Mabery, RN begin by assessing the hair being treated and determine the best route for treatment. 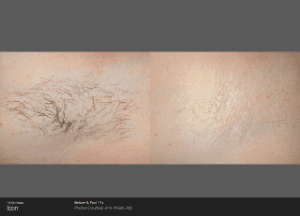 Laser hair removal works by distinguishing pigments in hair. This differentiates dark-colored hairs from lighter colored skin, and eliminates the hair by destroying the hair follicle through its absorption of the energy from the light. Laser hair removal is more advance then electrolysis because it the laser can target large areas of skin in a short time period. Discomfort is minimized using numbing cream (free of charge), ice and a Zimmer cooler that blows cold air at the treatment area. Depending on size, treatments can be done in a relatively short period of time. Ethnicity, hair density, and hair color versus skin pigmentation are various factors that influence hair growth. Hair is not the same for every individual and it will react different when treated by the laser. To adequately treat unwanted hair, multiple session will be required. Treatments are usually purchased in packages of treatment sessions. Each session is separated by a few weeks, to allow new hair growth to be targeted. Hair from the face (except around the eyes), back, chest, arms, underarms, bikini line, and legs. The Icon targets hair cells responsible for hair growth without harming surrounding tissue. Your treatment provider can help tailor a plan just for you. You do not need to let hair grow out between treatment sessions. 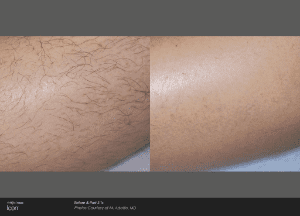 Laser hair removal is more affordable than you might think. Packages come in 3, 5, and 7 session. Packages are discounted by ten, fifteen, or twenty percent off. The Icon, as an advance laser is significantly less painful than older laser hair removal machines. The laser hand piece that touches the skin has a chill tip to cool the skin before and after the laser pulse which significantly reduces pain. Most people feel only a slight, momentary “snap” at the treatment site during the procedure. You can resume regular daily activities immediately following treatment. The only restriction is that we advise avoiding extra heat to the treated area (hot tub, bath, etc.) for the remainder of the day. Some typical side effects of laser hair removal include a mild sunburn-like sensation (redness), accompanied by some minor swelling immediately following the treatment. This doesn’t always happen, but if it does, it often occurs with thicker hairs and the swelling usually appears around each hair follicle. This is a good thing, indicating an effective treatment where the follicle has been destroyed! For more information on laser hair removal or any other laser treatments, contact our Santa Barbara plastic surgery office. We are committed to helping patients achieve and maintain vibrant and healthy skin. Part of the commitment includes post-recovery products for all laser hair removal packages. Partnered with SkinCeuticals to provide the highest quality science backed skincare products. Protect and enhance results with specifically picked products. Body Retexturing Treatment: Gel treatment for the body exfoliates and hydrates simultaneously to resurface dull, rough skin. Light Moisture UV Defense SPF 50: A broad spectrum, oil free sunscreen for face and body that provides high UV protection while moisturizing skin in a weightless lotion. In addition to laser hair removal, we also offer treatment of uneven pigmentation with The Icon using a different treatment handpiece. This treatment is called IPL (Intense Pulsed Light), and is also commonly referred to as a photo facial. It treats problems such as uneven pigmentation or visible facial blood vessels. For stubborn pigmentation issues such as melasma, or for skin that has a little more pigment, the PicoSure Focus Skin Revitalization treatment is more effective, usually combined with a Skinceuticals regimen for pigment reduction. Cynosure has even developed an incredible advancement in tattoo removal technology which now offers better clearance of tattoos in less time that it would take using previous lasers.